If you're looking for the loveliest sunsets and sun rises, you definitely want to stay here. It is absolutely beautiful to watch the sun over the water. There are mosquitoes and small bugs, due to it being on the water. So be careful when leaving your window open for fresh air. Staff was nice and helpful. Rooms were very tight but clean. Really great value for money. Nice little place right next to the East Side Gallery, restaurants, and pubs. The boat has its own nice bar which has comedy nights once a week. The atmosphere is more family/quiet oriented. There wasn’t much socializing/partying, but that’s not a mark against it so much as a comment on what to expect. Overall, great value for money. Our room was a little small but we expected that. We had two windows that opened up to the water side which was nice to get some fresh air. At times we could feel the movement of the boat, but not enough to make anyone dizzy. We liked the weekly comedy show, and never tried the breakfast. Really nice place with welcoming staff. Also happy to help which is nice. Good location. Good value. A second bathroom for the dorms would be nice. I recommend the place. It’s amazing to sleep on a boat! But it’s not fair to pay extra money for the blankets. Anyway the facilities are fine but I had to share them with the people of a bar on the roof of the boat. That’s quite weird if you go to brush your teeth and next to you are a group of drunken guys taking a p***. And you also have to pay extra for the breakfast. The beds also quite old. Nice idea with the boat but they could renew some habits. 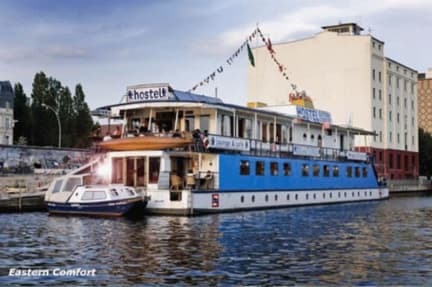 Very cool hostel on a boat but if you want to party probably not a goos choice. Its quite small so they really enforce quiet hours so it was hard to stay on the boat if you wanted to chat and drink a bit. Great location though, right behind the East Side Gallery. Close to transit. Very cool neighborhood. It's pricey for what it is... The room and bathroom are very small. And they charge you for sheets... But the staff is friendly. 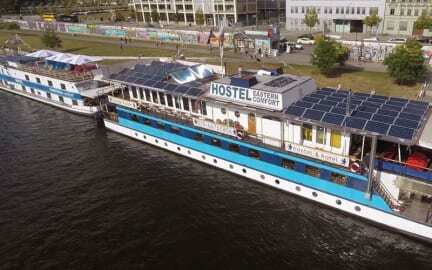 This hostel was very cool as it was a boat that is located literally right beside the Berlin East Gallery. It’s secure with door codes and your own room key. However, rooms are extremely tight with not much room for you to open your baggage and bathrooms/showers were fine with hot water but a bit dingey. We also had to do all the bedroom linens ourselves. I would recommend to stay here for the unique experience, not for a high quality room/facilities. Do not stay in this boat hostel, if you don’t want to get robbed! This hostel literally do not ask guest for ID document, or any document at all. semebody in this hostel robbed my macbook and left in a way that it was almost impossible to give proper report to the police. They gave me some shady info about their cameras and they clearly didn’t want to interact with the police just because one customer got robbed. But I went to the police and gave all info I could.